= Kono pan yakitate dayo! = This bread is freshly baked. みなさん、こんにちは！= Minasan Konnichiwa! = Hi, everyone! Before I begin, let me tell you about the updates. As you know, I now can post new lessons but we have lost a lot of pictures and sound files on this Maggie Sensei’s site. I have reposted almost all the pictures and I am now working on the sound files. So please wait until I finish recording all of them. The good news is, you will be able to hear all the sound files with your iPhone or iPad from now. Also I have been fixing the old lessons format as well deleting flashy highlights. Hope you notice the difference. OK, will keep posting review lessons from my Facebook lessons. verb + たて ( = tate) means ”newly/ freshly/ just did something”. By adding の ( = no) you can use it as an adjective. = Kono pan wa yakitate desu/ yakitate da. = This bread is just baked. Note : 〜だよ ( = dayo) is a casual suffix. Both men and women can use. = Kono tango wa oboetate desu. = (This is the word I have just learned.) I just learned this word. = The freshly friend potatoes are good. = Kono poteto wa agetate da. =This potato is freshly fried. Note : We often see/hear Vたて ( = tate) in advertisements because “freshly made something” sounds very cathy. But when you use it with people, it adds the nuance of lacking experience. = Mada menkyo toritate nanode unten ni jishin ga nai. = I just got a driver’s license so I am not comfortable driving. = Kono ryouri wa dekitate hoyahoya desu. Note : ほやほや( = hoyahoya) is an onomatopoeic word to describe something fresh from the oven and steaming hot. Also it is used to describe something/someone new. 新婚ほやほや = shinkon hoyahoya = a couple just got married. = Kono ressun wa dekitate hoyahoya desu. = This lesson is freshly made and steaming hot! Maggie sensei , i’d like to know what is the difference between vstem+上げる and vstem+終わる? I’m still confuse how and in what condition i should use them . For example, when you are writing a book and finish writing. 書き終わる= It simply means you finish writing. 書き上げる = It also means “you finish writing” but it implies you have worked so hard writing the book or you “finally” complete your work. Many thanks for the clear explanation. Both mean “just completed” so, am not sure when to use which one!! Sorry for the late reply. I was resting until I get to Dog Heaven. you use V+あげる when you you do something until you complete/finish it.So it usually requires certain effort or time. Now we can see your comment!! Thank you!! 1) So I guessed that kanji out of the blue. XD That was my impression sensei, that if it had a kanji form it wasn’t used very often so sensei didn’t find it necessary to feature it. It may be just me wondering about things which may not be very useful. XD But then I have to admit that after climbing that huge wall which comes to be the process of learning kanji, kanji tend to help in remembering words and their pronunciations when you memorize or are able to remember the kanji that form the words. Kanji sometimes help to remember words, right sensei? 2) Thank you sensei. The place in which I looked that word up had that word with that kanji, but it didn’t have the definition sensei provided. 3) Oh, sensei always seems to kindly correct comments so I thought that one was correct. XD That sentence makes a lot of sense to me. :D And it is a complex sentence I will enjoy studying. 1) You have a good point! Maybe I should add kanji in that lesson anyway. You are right. Kanji help many people to remember words. 3) I am usually “strict” correcting sentences but I guess I was “nice” at that time. I should remember there are people who also study in the comment section. Right sensei. hmm, I still feel kind of guilty of encouraging sensei to go through even more work considering how detailed sensei’s lessons already are. ^^’ I think it is a great idea, maybe if the kanji is not used much in practice, sensei could just mention the kanji in the beginning of the lesson and then go the normal way for the rest of the lesson. I have seen sensei do this before in some lessons, so this idea actually comes from you sensei to be honest. Just a suggestion. No, I really appreciate your suggestion. I should have included that information. This lesson came from the Facebook lessons. I thought I included more information but obviously I didn’t include the kanji part. Thank you!!! 1) Does ~tate by any chance have a kanji? For example, the one for “立つ”, maybe? Likewise, does this verb have a kanji as well? I tried looking up this verb but none of the ones I found gave the meaning of “to start using something new”, so maybe the kanji form (if it has one) would help me differentiate it among the others. a) sukunai kotoba: Does it really mean rare word? Maybe there is something being ommited that I don’t get. b) tsukawareta: This is the part I get the least. Is this supposed to mean: “were you able to use it?” Or maybe “was it used”? You finished all the lessons now. お疲れ様！！ I don’t know how many people have studied all the lessons. I am very impressed! OK, let me answer your questions. 1) Yes, ~たて has kanji 立て. Some of the ~たて words are more common with hiragana so I didn’t write kanji. 2) orosu = 下ろす/ Oroshitate = 下ろし立て. 3) Actually I didn’t correct the comment but I figured out the meaning. = You wrote the verbs that we use with ~tate are limited compared to “~bakari” but do you use that word often? I’d just like to tell you how much I love your blog ! I’m going to study in Japan for the following months and to be honest, it really makes me nervous since my japanese level isn’t, well… incredible. But each time I visit your website, it gives me hope and makes me feel like I want to learn everything and start a conversation with any random japanese passing by. From the bottom of my heart, thank you Maggie Sensei ! You may not realise how much your lessons can mean to someone… I can tell you : a lot. Your message made my day! You already have a great attitude to learn other languages. You will learn so many new things while you stay in Japan. Nobody will bite you so don’t worry. Just relax and enjoy your study in Japan. 1) Oh I see sensei! 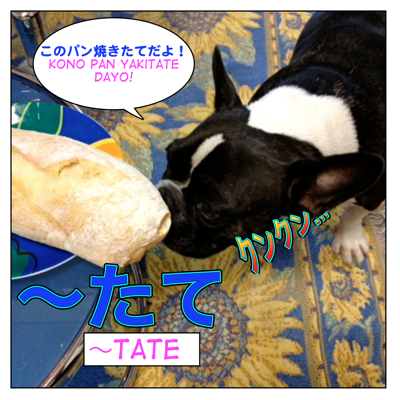 V+tate is used in special occasions with specific verbs. In other cases I will try using “bakari”, it is a safer bet, isn’t it sensei? I will do my best to memorize these examples using “tate”. I am always here for you and help you improve your Japanese. “I just read this new lesson from sensei.”. (This is the word I have just learned.) I just learned this word. 1) Does v+tate work as some sort of passive form of verb? I just got a driver’s license so I am not comfortable driving. Maybe I could translate this to: “The driver’s license was just gotten so I am not comfortable driving”. Does this make any sense sensei? XD It is like v+tate focus describing the noun instead of the person who makes the action and thus the person is omitted and kind of left to be understood by analyzing the situation? 包括的に→Wow! You know a difficult word. But what did you want to say? 1) Ummm not because it’s a passive verb or not but like I wrote in the lesson, the verbs you can use with ~たて are much more limited than ばかり. I wrote the basic ones in the lessons and if it doesn’t work use ばかり. 2) Ah I see. 包括的に is a big word which we usually see in the news or thesis. I have a small question what is the difference between ばかり and たて? ばかり is more official or something? Can we use both of them in speaking and writing or maybe not? When you talk about your daily actions, you usually use ばかり not たて. So たて is used when you describe certain condition more than action itself and we use it when we stress the freshness. I see Thank you ! Have a nice weekend! Glad to hear you check my Facebook lessons as well!